My children's new favorite Disney movie is Frozen!! Of course just like millions of other children in the world! If you don't already own the dvd you can enter to win a blue-ray copy!! 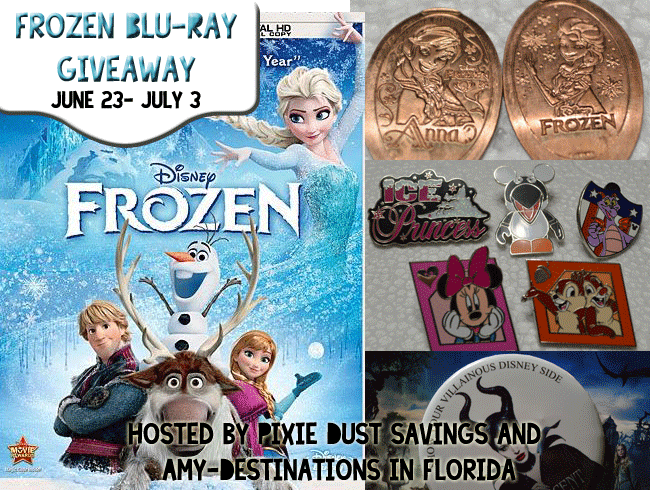 Amy, an agent with Destinations in Florida, joined the Pixie Dust Savings team recently and is offering a brand new, factory sealed Blu-Ray copy of Frozen. Along with the Frozen Blu-Ray you will also get 5 Disney Trading Pins, a set of Anna and Elsa pressed pennies, and a Maleficent Button from the 24 Hour party! Good Luck!